We painted all of the model poses this week and I'm uploading only one painting from class. Three models were painted simultaneously in a 20-30 minute pose and I didn't get to finish the third model. This was my first experience using PhDrMartin liquid watercolors, and it was fun. I bought 3 primary colors and mixed what I needed. However, I hated throwing away even the small amount of mixed colors on my palette and would hate carrying them around when painting away from home or the classroom. Collage as Fashion Illustration: Week 12 we sketched 4 models and then selected one to turn into a collage. Our professor demonstrated how to trace the big shapes, and then to cut around the shape from the tracing paper and collage paper simultaneously, in one layer. We brought black, white, and one other color, either gray or brown. This collage was made by gluing my shapes over my drawing. Next Week: My first experience using Dr. Ph Martin liquid watercolors. 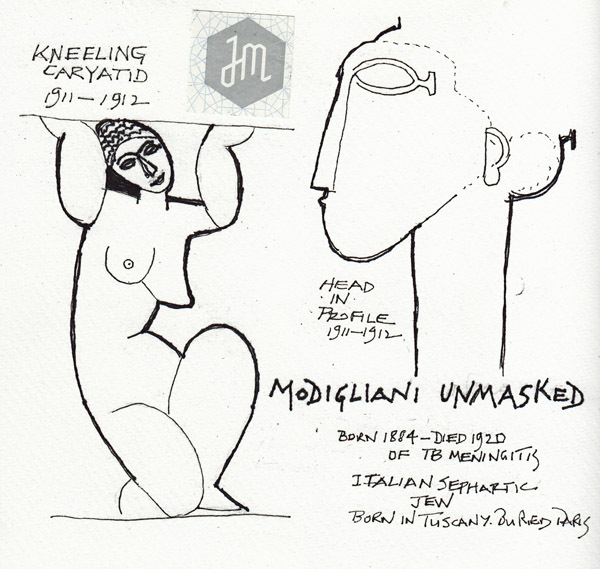 I loved how he explored African Masks in drawings, and then modified his portraits over time to lengthen the face, nose, and neck. He also did many drawings of caryatids, and fallen caryatids, for a second series that was well represented in the exhibit, moving from drawings to paintings. 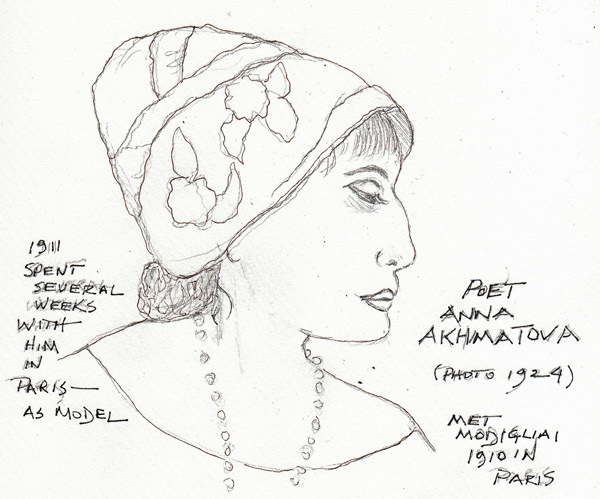 I also sketched the photo of a Russian poet who modeled for him, and with whom it is alleged he had an affair in Paris. 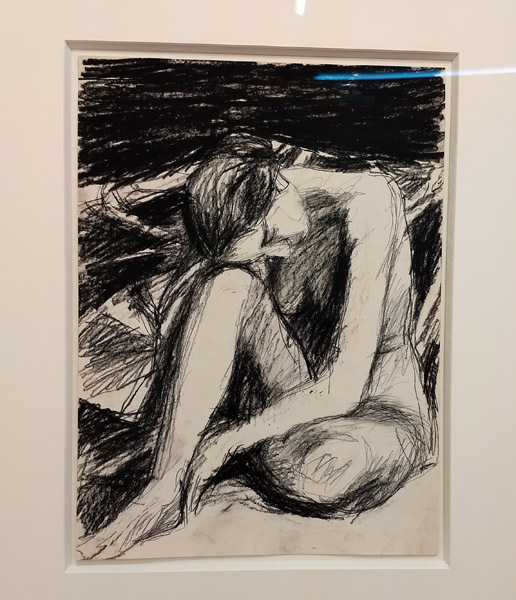 After lunch we walked down Madison Ave to Van Doren Waxter Gallery to see Richard Diebenkorn: Works on Paper (1922-1993) - through Jan 20, 2018. I love his figure drawings, and took a photo of my favorite in the exhibit. Richard Diebenkorn was an abstract expressionist in the 40s and 50s, and then turned to figurative art in the 50s and 60s. This is my photo of the painting for which the exhibit was named. 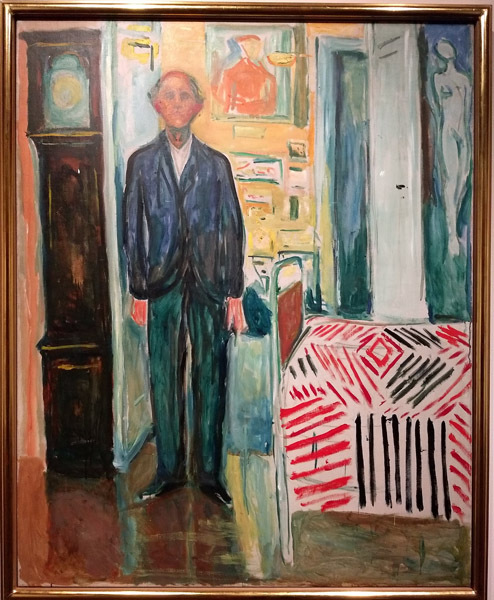 My favorites were his many self-portraits. 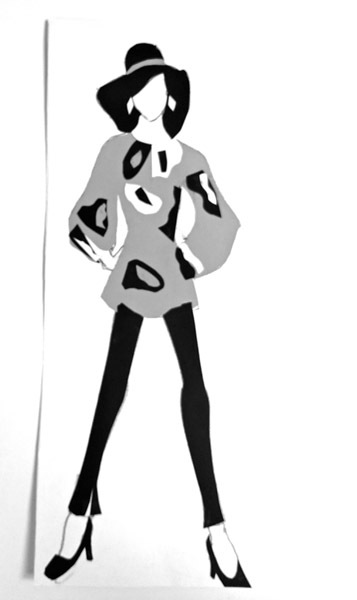 We continue to learn many mediums for doing Fashion Illustrations during this course. And our professor brings in classic examples from some of the great illustrators and designers. During the last two weeks we used markers one week and brushes and India Ink the next. I found this very difficult because I rarely use markers, and of all the drawings I did that night, this was the only one that I managed to both be loose and elongate the image. These sheets of paper are all 18" long. Drawing with Brushes and India Ink: I felt much more comfortable using a brush than markers. The illustration on the right was done by my professor, Janis B. Salek, who is amazing. 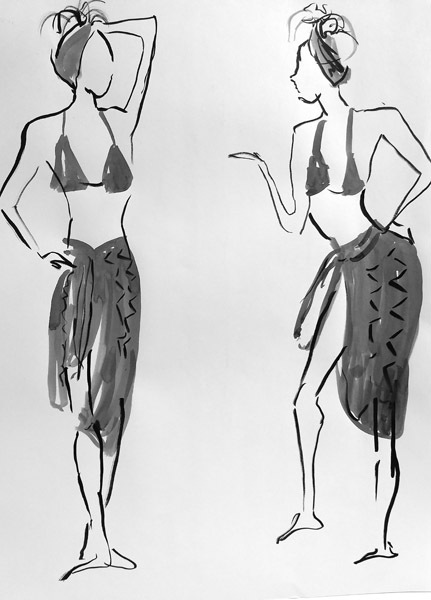 She wanted to demonstrate the technique she uses with ink and dilutions of the ink - in a bold, elongated figure. She sat down at my easel and just drew this in several minutes! I then tried to use a similar technique for the next fast pose as drawn on the remaining paper on the left. This is one of many subsequent drawings - we had 5 models rotating continually - alone or in groups. It is one that I was most pleased with. We catered Thanksgiving for 19 adults and 9 children (ages 2-14). We cooked at our apartment on Tuesday, took 3 boxes and 3 bags of stuff to my daughters apartment on Wednesday morning, where I made potato leek soup with Henry (our 14 year old food loving grandson) and my husband prepared a 25 lb fresh turkey while our 8 year old grandson Zach from around the corner watched. When we finished cooking, and were waiting for the soup to cool enough for the fridge, Zach and I "did art." We copied a cartoon turkey drawing from "Art Projects for Kids." 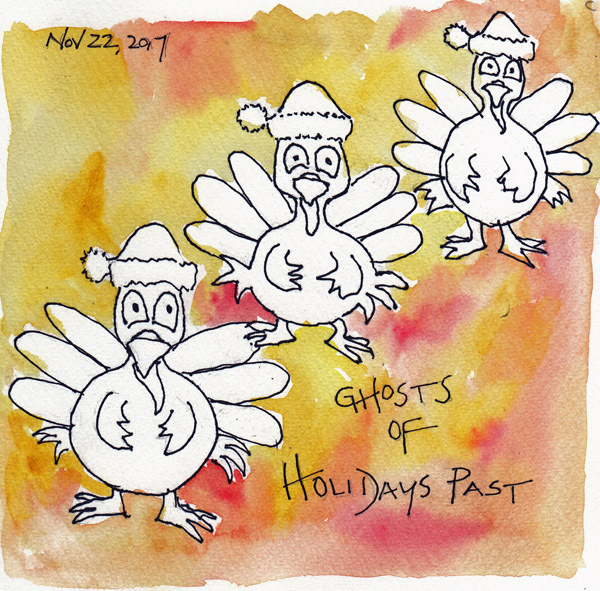 Zach took his home, but here is mine, entitled Ghosts from Holidays Past." 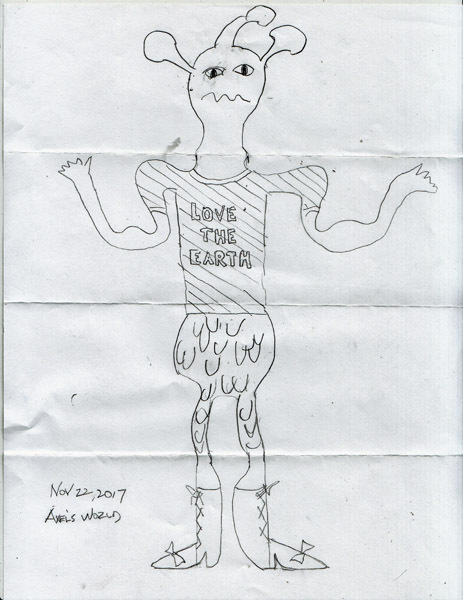 Zach told me he wanted to draw with me, and described the method for "Exquisite Corpses." I had to email Pat because he didn't know the name and I couldn't remember it. We divided a piece of copy paper in fourths, and hid our drawings from each other as we moved down section by section. We did 6-8 different ones, and saved this one as a friend for my imaginary character Axel. He drew the head, and marked the neck lines at the top of my section. I then drew the neck and chest and marked the waistline at the top of his section. He drew hips and legs to the knees, and marked the leg lines, and then I drew calves and feet. Only then did we have a big REVEAL! 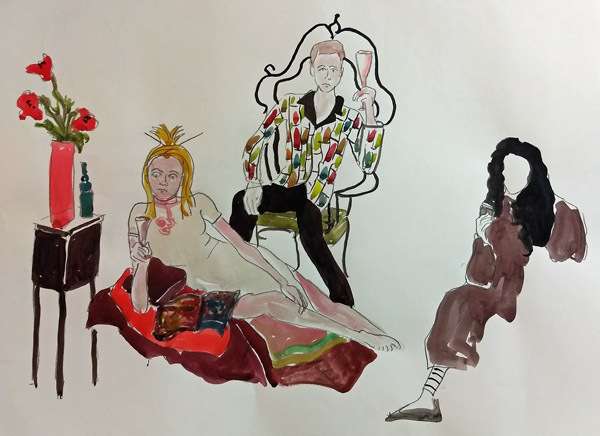 The Surrealists popularized Exquisite Corpse drawings as a parlor game. We did it at MoMA one time when they were providing the paper and posting the results in the main lobby and online.